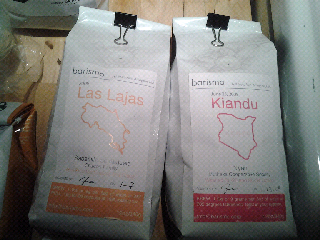 While collecting items in our kitchen coffee setup to cup late night, I came across these two bags. The design is one I worked on with Lex Nemzer and I still like it a lot. It really brought me back. I am now cupping this against a 'blonde roast' and some of our newer coffees late night to get ready for radio time Friday morning. I only opened the Costa to try now, saving the other for the late. Honestly, it still had some character but not a bit of surface oil which considering how old it is I was impressed. The flavor though was quite stale compared to fresh coffees so it was not all that unexpected. Lesson, drink fresh coffee, store the labels for posterity. It was really fun to look back at the old label to remind me what an uphill battle it had been to push quality the way we have. Glad to see things progressing so quickly these days.